This chapter provides a synopsis of the key findings of the study. 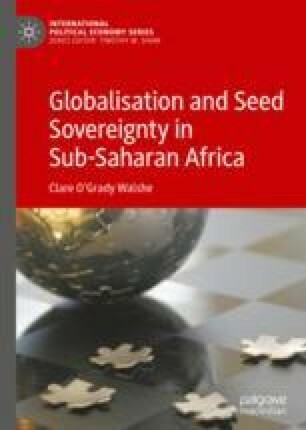 It suggests that transformationalism is a useful framework for assessing changes in seed practices in sub-Saharan Africa and argues that hyperglobalist seed laws and practices can be avoided if there is sufficient political will. It ends with a call for decisive action to generate more equitable outcomes in the seed space. It identifies four areas for immediate action: (1) The revision of international seed law and policies; (2) the evaluation of all existing and proposed domestic seed laws and policies; (3) the expansion of community seed banks; and (4) the development of evolutionary breeding systems that will generate genetic variability that could become central to national programmes for future-proofing for climate change. De Schutter, O. 2009. Seed policies and the right to food: enhancing agrobiodiversity and encouraging innovation report of the Special Rapporteur. A/64/170 United Nations General Assembly [Online]. Available from: http://farmersrights.org/pdf/righttofood-n0942473.pdf [Accessed 23 February 2013]. DIVERSIFOOD. 2018. DIVERSIFOOD Report: Community Seed Banks in Europe. DIVERSIFOOD stakeholder workshop in Rome on 21 September 2017. Available at: http://www.diversifood.eu/community-seed-banks-in-europe/. Accessed 26 December 2018.